Sterling silver, stamped, tufa cast bracelet with a oval free form kingman turquoise stone and a twist wire border. It is of good weight and measures approximately 1 3/16" wide. The stamping is almost end to end. It is Navajo hand crafted by Hemerson Brown. 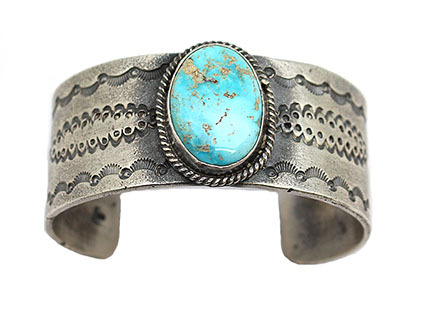 Only this one available and is a 5 3/4" wrist size with a 1 1/2" opening.